The photogenic Saints were top after Round 14 but fell in a big heap which took them several seasons and some astute recruiting to recover from. 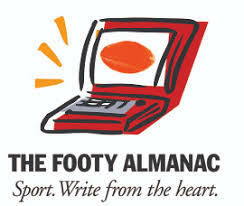 Robert Harvey’s consecutive Brownlows and “Spida” Everitt’s burgeoning persona gave the fans something to enjoy each week, but their mid-tier performers disappointed. 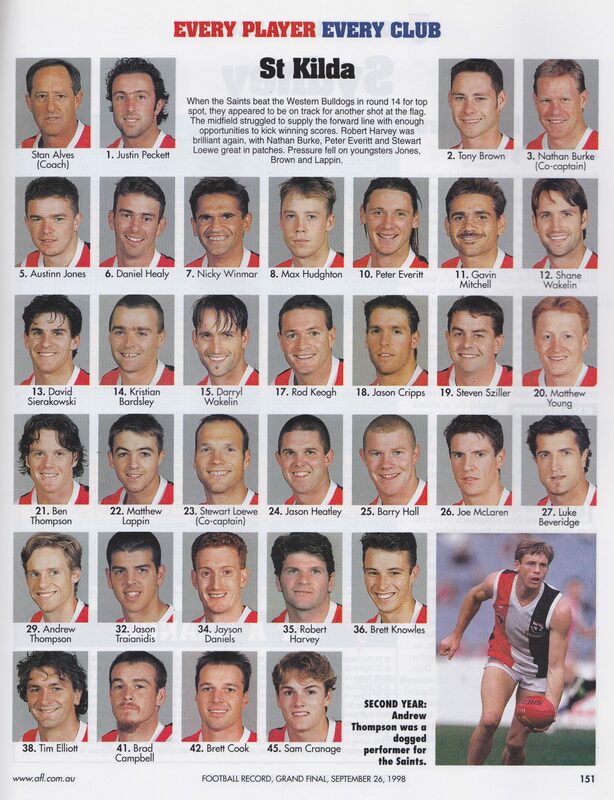 Many moves in were made in the ensuing years such as Winmar (WB), Lappin (Carlton), Hall (Sydney), Everitt (Hawthorn), S Wakelin (Collingwood), D Wakelin (Port), Sziller (Richmond) but the biggest of them all was Healy (Centrals. 5 flags, 4 as captain). And how come Bevo looks older in this photo than he does now? Seen any of them recently at Southland JB Hi-Fi? Shared a knowing look in the Bonds Shop at Moorabbin DFO? Bought your “weekend supplies” from their pharmacy? The comment box awaits. Justin Peckett was an afacianado (never can spell that word) of classic American cars. Kristian Bardsley, nee Anning has a photogenic smile. A few years prior GOD did some dental work on him @ Kardinia Park. Rod Keogh made an impressive debut for Melbourne in 1990. Kicked 2 goals, one of the best V Carlton. Numbers 36-45, i really can’t recall. Keep up the good work ‘Swish”. Looking forward to the 1969 Carnival team(s). Alves achieved a lot with extremely limited support during that period, never had the full backing of the board. The unnecessary y in Jayson Daniels’s name always bothered me more than it should have. the Wakelin brothers Darryl and Shane from Port Adelaide Magpies played in a premiership and runner up with Port Power and Collingwood respectively. great squad and should have jagged one. Always surprised that Alves never got snapped up. he did good media work. 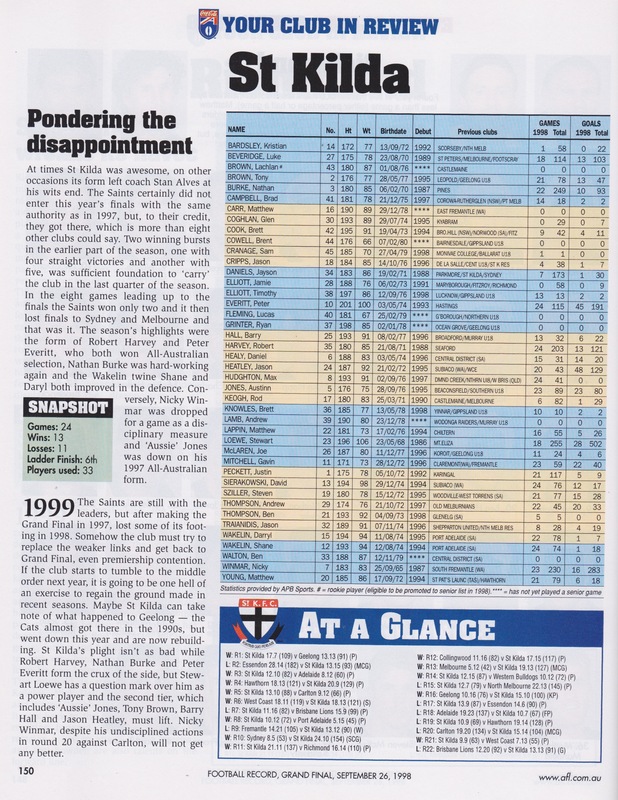 They made the right wrong call when going for Watson when roos might have worked (Richmond chased him that year). and Blighty, well… right guy wrong place and time. Let’s remember the superb cultural contribution of this club and key players Peckett and Wakelin et al to the video for TISM’s Greg! The Stop Sign! which was about this time.